A significant increase in death threats leveled at Scott Pruitt led to security officials to recommend the Environmental Protection Agency administrator fly first class. Journalists and liberals have made light of security concerns, mocking Pruitt for following the recommendations from the head of his 24-hour security detail, which was required due to "unprecedented" threats. The Washington Post reported Sunday that Pruitt had spent $90,000 flying in first or business class. The article briefly notes records showing Pruitt does so for "security concerns," and that the regulations allow officials to fly first class under "exceptional security circumstances." By Thursday, the Post reported the decision to fly first class was made by Pasquale Perrotta, the head of Pruitt's security detail. The security team said there are many reasons why flying first class is necessary for Pruitt's security, such as "the chance to make a quick exit if a situation arises." Politico questioned the need to fly first class in an article Thursday that made no mention of the death threats against Pruitt and his family. "Pruitt's security threat? A passenger shouting, ‘You're f—ing up the environment'" the headline reads. Journalists and liberals seized on the story, mocking the example of the threatening environment faced by Pruitt, given by Henry Barnet, the director of the EPA's Office of Criminal Enforcement. Barnet cited an incident at an airport where a liberal harassed Pruitt, recording him on a cell phone, while yelling, "You're f—ing up the environment." Vanity Fair claimed Pruitt's "excuse" for flying first class is "whiny environmentalists." "Apparently, individuals going up to the E.P.A. administrator and making completely factual statements was a bridge too far… It's not totally clear why the security team believes that only people flying coach think Pruitt is a prick who deserves to be told as much, but perhaps they'll address that at a later date," the fashion magazine wrote. A reader had to come to the end of the Politico story to discover that the "threats are so prevalent" against Pruitt that his security detail has to perform a new threat assessment every 90 days. "EPA instituted 24/7 protection for Pruitt last year, a step up from previous administrators who typically were guarded only when in public or traveling," the penultimate paragraph of the Politico story reads. 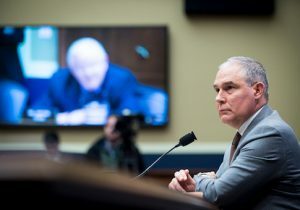 "Citing security concerns, EPA does not announce Pruitt's travel plans ahead of time, a departure from the habits of previous administrators who would often alert the media about upcoming trips, particularly overseas," the article concludes. "Barnet said that scheduling announcements are not a decision made by the security detail." The article fails to mention the number of death threats Pruitt and his family have received. "He has had significantly more threats directed against him," said Patrick Sullivan, the EPA's assistant inspector general for investigations. "There's absolutely no question about it." Pruitt told Bloomberg News last year that his family was also being targeted, and security officials said the administrator had received threatening letters and packages delivered to his home. "The quantity and the volume—as well as the type—of threats are different," Pruitt said. "What's really disappointing to me is it’s not just me—it's family." Pruitt recently said he does not make the security decisions but blamed a "toxic" political environment. For instance, the FBI had to open an investigation after a drunk viewer watching MSNBC's The Rachel Maddow Show threatened to kill Pruitt and Senate Majority Leader Mitch McConnell (R., Ky.). A San Francisco columnist justified the increased number of death threats against Pruitt last fall, saying the threats "make a warped sort of sense." Pruitt has received up to five times the amount of threats than his predecessor Gina McCarthy, Sullivan has said. The inspector general opened 70 threat investigations in 2017, nearly double the amount during the previous year. Pruitt has received direct threats, such as, "I'm going to put a bullet in your brain."